Because I travel so much, people often ask me to name my favorite country. It’s a tough question to answer, because many of the places I have visited offer something truly special and unique, such as: quaint small towns (Spain); amazing wildlife (Kenya); beautiful beaches (Greece); amazing SCUBA (Maldives); or loads of ancient monuments (Egypt). But when pushed for an answer, I always say Italy and Myanmar. Many, many people have visited Italy: it’s hugely popular and for good reason. However, not many people have visited - and in some cases have never even heard of - Myanmar. This fall I ventured to this wonderful country with a group of friends who had never been there before, and I have to say it still held many magical moments for me, despite it being my 4th time there! 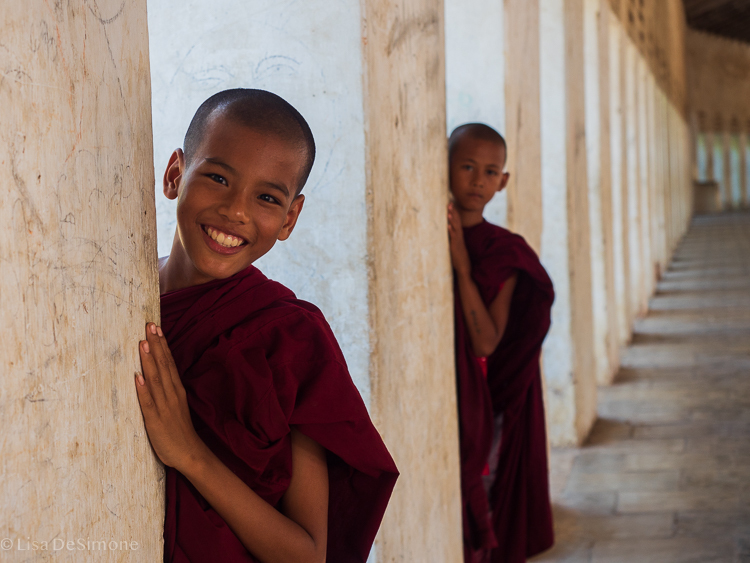 My first time visiting Myanmar was nearly 15 years ago, and while much has changed since then, the main things I love about the country have remained the same. Culturally, I find Buddhist countries to be fascinating, and for me visiting various temples (both ancient and new) and monasteries is a highlight, as I always feel that I learn something. 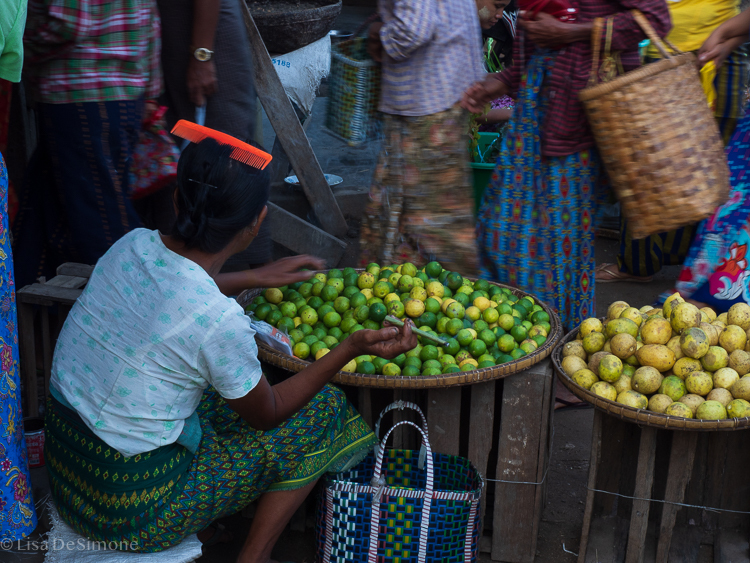 Additionally, it is still possible to witness local life in Myanmar: unlike many places in other Southeast Asian countries, the main areas of interest haven’t yet been totally overrun, as tourism in Myanmar is still somewhat new. That said, visiting the country is becoming increasingly popular. 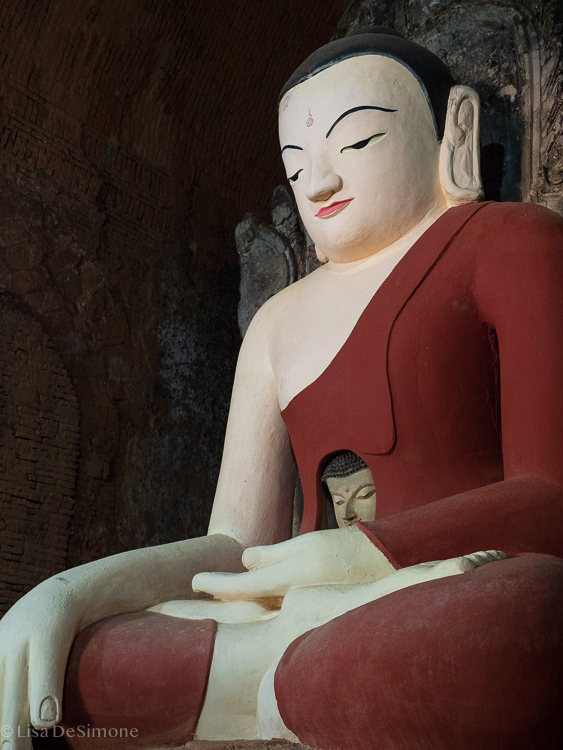 A country as poor as Myanmar can easily be swayed by the inflow of tourist dollars, and I imagine there is real concern that the country’s authenticity could be ruined. But the one thing that always draws me back to Myanmar time and time again are it’s warm, kind, colorful, humble, peaceful people. One of the women who hosted us for lunch during our trip said that “Myanmar people smile with their hearts” - and it’s very, very true: they are some of the most lovely people I have encountered in all my travels. I have never felt unsafe when traveling in Myanmar, nor had an encounter with a local that made me uncomfortable in any way. A friend wrote in an email to his parents back home that “Myanmar is in the news these days for all the wrong reasons”. I could not agree with that statement more. Given the situation with the Rohingya in the western state of Rakhine, many wonder if it is safe to visit Myanmar. Google “Rohingya crisis” and you will come across article after article recommending not traveling to the country. The media hype is just that, hype. I can tell you from first hand experience that say YES, it mostly certainly is safe!! One of the other pressing concerns of anyone traveling to Myanmar during the current refugee crisis is whether their money is in any way funding the military operations. My response would be that as long as you are using your tourist dollars to support local communities and/or operators that have a high level of respect for Myanmar people and that work in an ethical way, you should feel good about spending your money here. 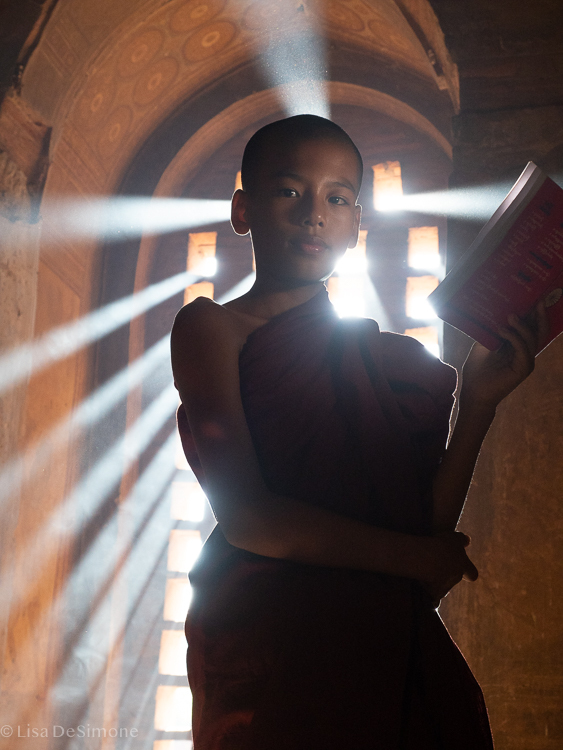 Choosing to travel to Myanmar at this time is, of course, a personal decision, but know that the current situation, political tensions and the Myanmar government’s actions are NOT reflective of its people overall. And that’s why it is so upsetting to me to hear from locals that tourism is down markedly across the country. So many small communities and kind, gentle people are suffering because of the decline in tourism that I would tell anyone who is considering a trip to Myanmar to book their ticket ASAP!!! You will not be disappointed. Infrastructure in Myanmar is somewhat behind relative to other, more visited, SE Asian countries - so having patience, an open mind and a good attitude are vitally important. Having someone else take care of all the arrangements will help you avoid many of the pitfalls that could occur if you attempted to travel around the country on your own. My friends and I did a custom trip arranged by ATJ, a US Based company that I highly recommend. Our local guide, San, was one of the best I have had. We purposely moved slower than most itineraries during our time in the country. We wanted to spend less time on busses and planes, and more time enjoying the sites we chose to visit. “Travel deeper” is my motto - it’s the best way to truly experience a place or culture! Our trip started in the middle of October and it wasn’t crowded at all (I think due to timing (the rainy season had just ended) and the Rohingya issue discussed above. During our trip I had a great many wonder-filled moments: visiting a children’s home and sewing workshop; biking through rice fields and high-fiving children in small villages outside of Yangon; ballooning over Bagan and discovering hidden pagodas on a private photo tour; feeding and bathing retired elephants; watching a religious festival on Inle Lake; and more great meals than I could describe. 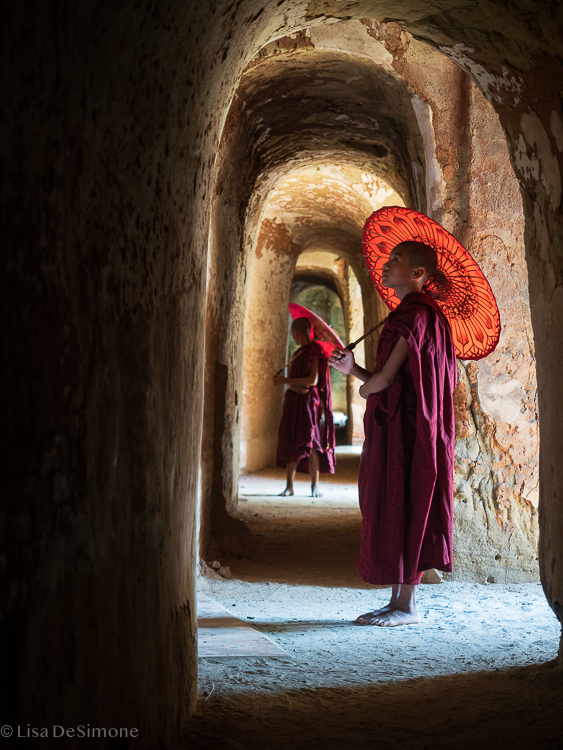 There is a lot to discover in Myanmar. Here I provide what I think are the most important places to visit and things to do for a first time visitor to this wonderful country. ANDIAMO! Yangon is the country’s largest city, and as such can be quite hectic with loads of traffic. This is most likely where you will fly into and despite the chaos, Yangon is a good place to get over your jet lag if you are arriving from far. I suggest at least two days, three if you can spare the time. There are definitely some sites worth visiting. 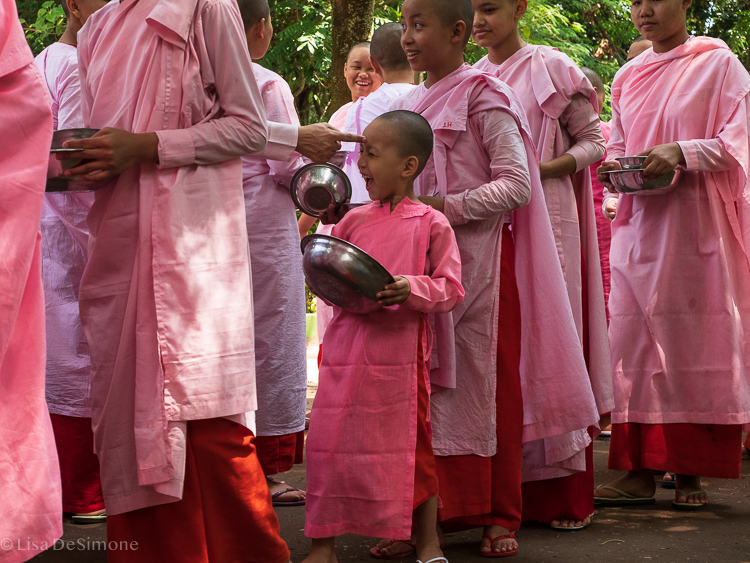 Enjoy seeing monks, novices and nuns going about their everyday lives at Kalaywa Tawya Monastery. 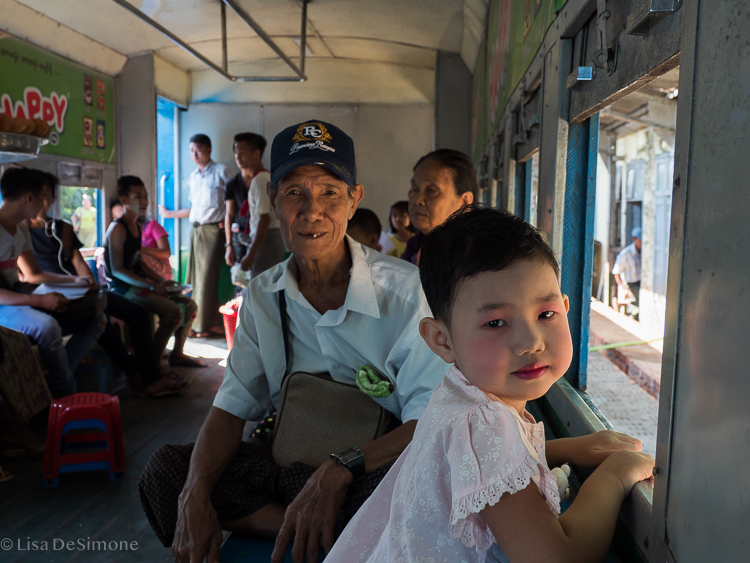 Ride the Yangon Circle Line Train for great photo opportunities and a view of local life. Mingle with locals at a characteristic street market, where vendors under bright umbrellas sell everything from mangoes to fish. 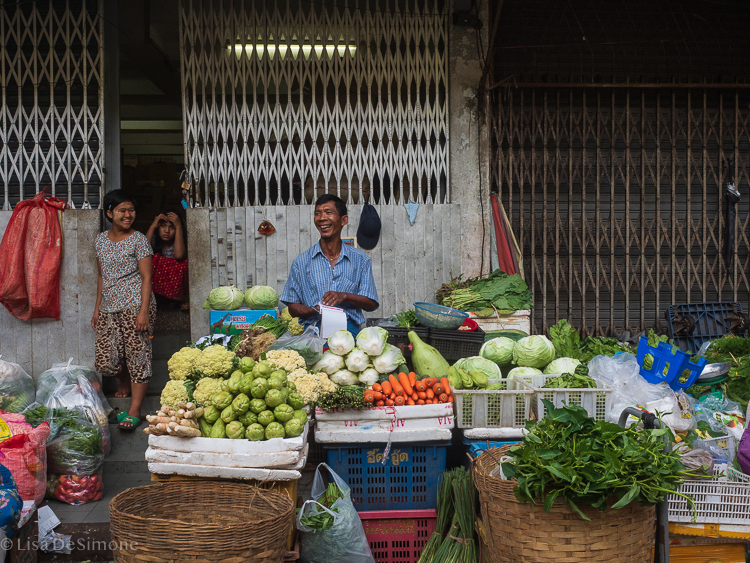 Take a food tour with Yangon Food Tours for an authentic taste of the local cuisine. Enjoy high tea at the grand Strand Hotel cafe. ﻿We stayed at my favorite hotel in Yangon, the Sule Shangri-La. Centrally located and attached to a new mall and food hall, it’s a high end hotel with a massive breakfast buffet (serving eastern and western food), an outdoor pool and comfortable rooms. You can walk to Scott Market from the hotel as well. Travel tip: If you enjoy photography like I do, I suggest spending a day with a local photographer from Luminous Journeys. 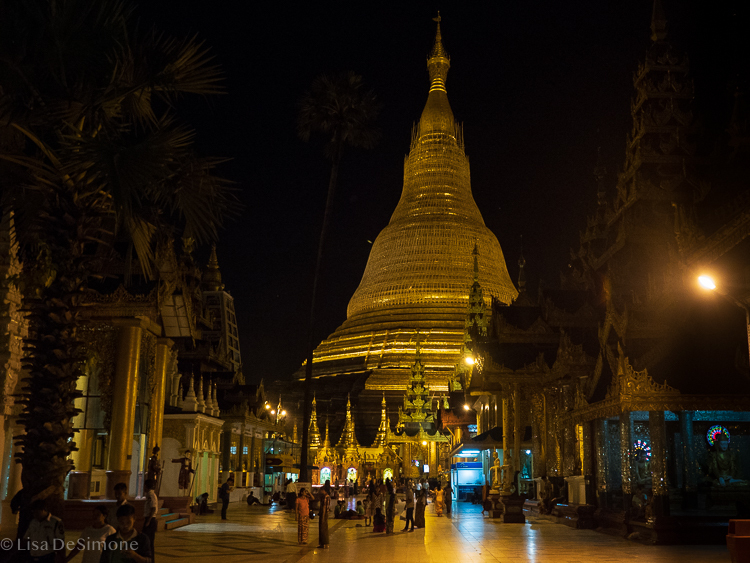 We visited local street markets, Kalaywa Tawya Monastery, and took the circle line train. I believe there was more on the agenda, but I had to cut the day short as I was meeting my friends for the food tour. Well worth the money. Bagan is one of the world’s greatest archeological sites! During its golden age in the 12th century, Bagan was known as "the city of four million pagodas." The setting is sublime – a large plain of palm trees studded with ancient temples. I’ve never received a consistent answer when I ask how many temples there are in Bagan, but it’s safe to say that there are at least 2,000 still standing. Some temples were damaged in the recent earthquake, but even so most are still well-preserved or have been restored by Unesco. When we visited it was blissfully uncrowded. It is possible to visit the archaeological zone in Bagan by bicycle, moped (what they call “e-bike”), horse cart, car, or bus. There are several temples that are quite large and fairly intact, and are not to be missed. Many of the 2,000+ temples still contain original frescoes and Buddha images. My friends and I spent 4 full days in Bagan, which is longer than most itineraries that I have seen. Even so, I could have spent longer! If temple-hopping is not your thing, 3 full days would suffice. 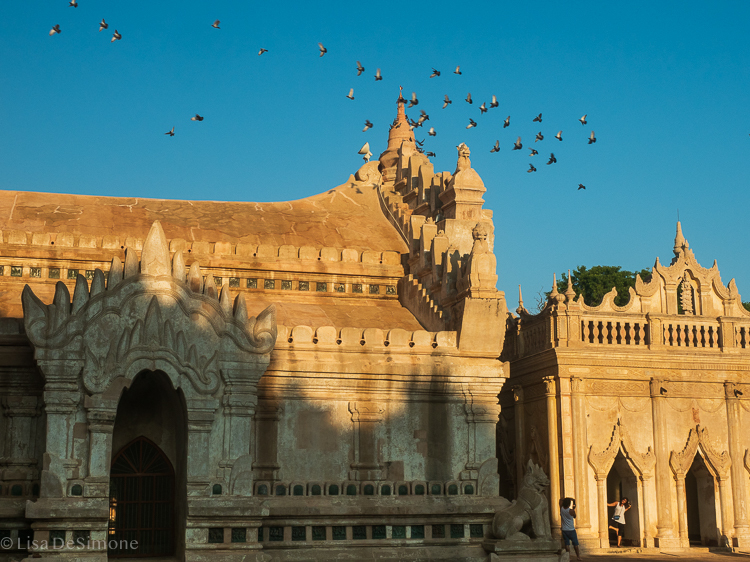 A popular day trip from Bagan is a visit to Mt. Popa. Mt. Popa is an extinct volcano rising nearly 5,000 feet above sea level. It’s an important pilgrimage site for people throughout the country. Honestly, visiting Mt Popa isn’t all the interesting to me and if you don’t have time, you can skip it and be fine (IMO). In Bagan, we stayed at the wonderful Aureum Palace Hotel and Resort. The location is ideal and one of the two swimming pools has amazing views of some temples! 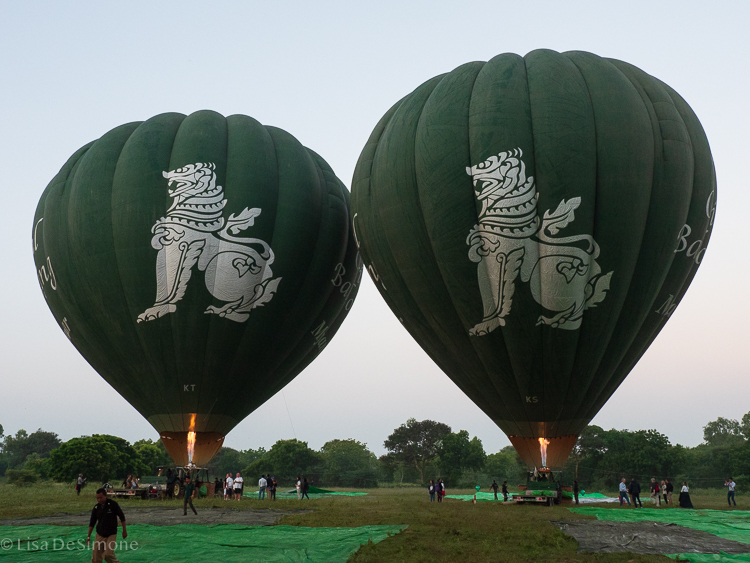 Travel tip: I suggest planning your hot air balloon ride in advance, and schedule it for the first morning you are in Bagan. Due to weather issues, we had two failed attempts at getting up in the balloon before they finally took us up on our last morning there! This was my 4th time visiting Inle Lake, and each time I’m there I can’t help but marvel: life on Inle is like no place else I’ve ever seen. 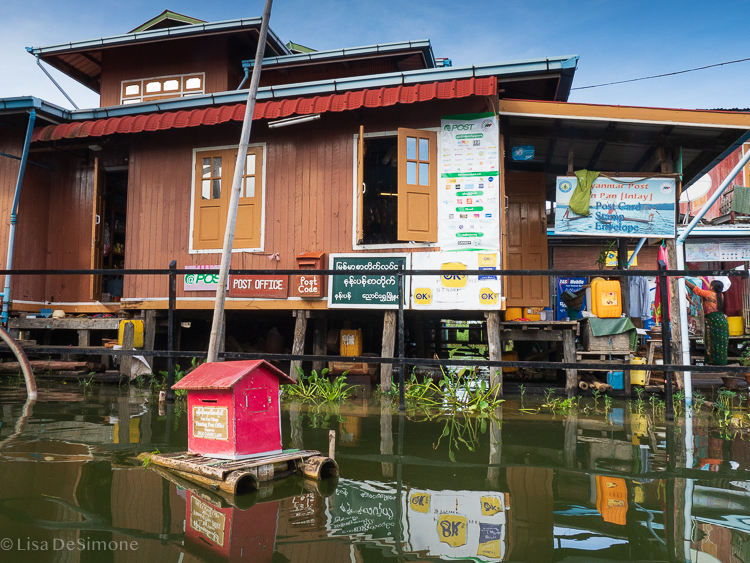 Families, businesses, restaurants, monasteries and even a post office float on the water, built on stilts and mostly constructed of bamboo. Floating gardens exist in abundance, with agriculture being a main source of income, alongside fishing and in recent years tourism. All transportation on Inle Lake is done by long boat. Everyone zips around the lake, going about their daily business or sightseeing. There are several temple complexes worth visiting on the lake, as well as silk weaving shops (a local traditional craft), and restaurants. We even took a cooking class while we were there. Your tour company will arrange all the boating for you in advance, or if you are traveling independently I am sure you can have your resort assist you. One of the other unique sites on Inle Lake are it’s famous fishermen. These locals have mastered an unusual technique when it comes to paddling their long boats, and it’s quite interesting to watch. 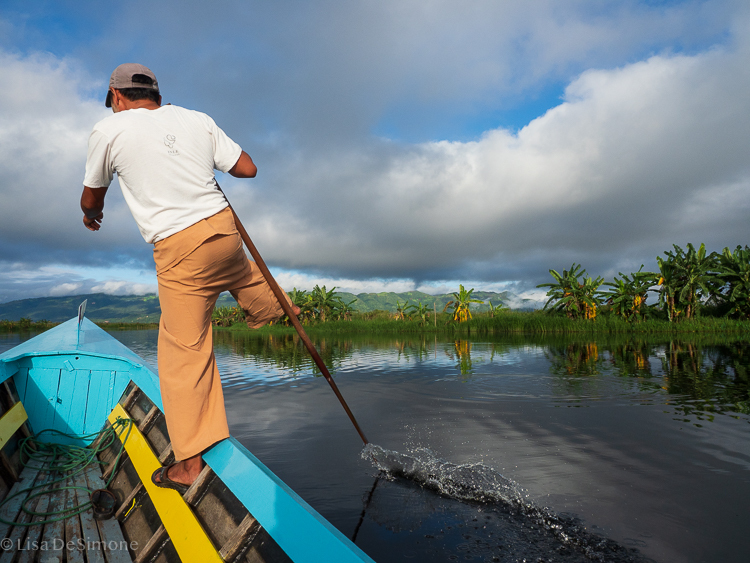 Carefully balancing on one leg, they wrap their second leg around the oar to guide the boat through the freshwater lake, allowing both hands to be free for fishing. This leg rowing technique is still used to this day, however the actual catching of the fish has changed. Most fisherman no longer use the conical shaped nets to trap and spear their fish - they now use long nets, as they are much more efficient. These days, the fisherman found on the lake wearing the traditional pants and carrying the conical nets are pretty much just “models”, posing for tourists like me. Nonetheless, it’s still fun to photograph them! Our timing was such that we were able to observe the Paung Daw Oo Pagoda festival. 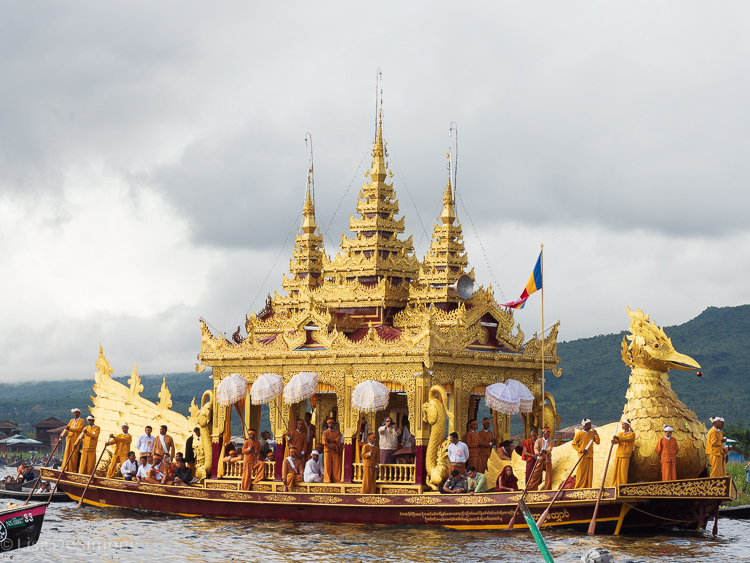 During this important multi-day, annual celebration, four small sacred Buddha statues (referred to as Buddha images) are ceremonially rowed around the lake on a colorful gold barge accompanied by many other boats steered by the famous Inle Lake leg rowers. 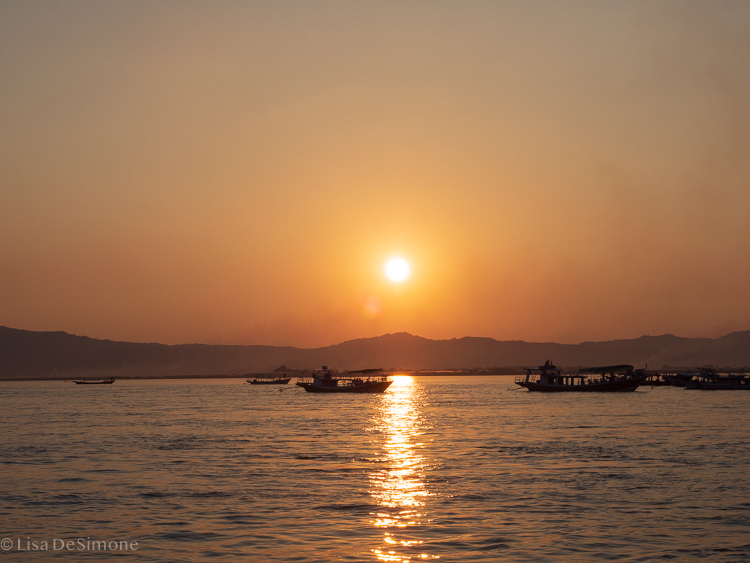 The lake was full of long boats filled with Burmese celebrants and tourists. We stayed at the Inle Princess Resort, which sits on the banks of the lake and is also reachable by land. It is located off the main lake, down a private inlet, and is very serene and quiet. The grounds are lovely and the staff is superb. The bar and restaurant are very good: one of my favorite memories from the entire trip was the private dinner we had in the wine cellar of the resort. Simply amazing. 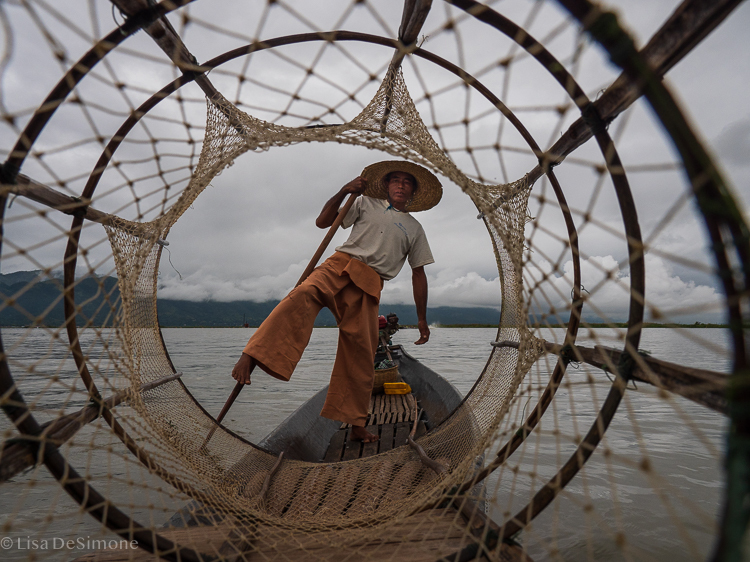 Travel Tip: The weather on Inle Lake is much cooler than elsewhere in Myanmar, so be prepared. We had a few days of moody clouds, but overall it was pleasant enough. We did two other things during our trip, which were both new to me. Kalaw. Heho Airport is the gateway to Inle Lake. Instead of heading straight there when we landed, we spent two nights in Kalaw. Our main reason was to visit Green Hill Valley Elephant Camp. This wonderful elephant “retirement” camp is home to 8 elephant who now live happy, healthy, work-free lives. We were able to feed the elephants and bath them in the river. The camp is run by a great organization, sustained completely on money paid by visitors. It was a fun, unique experience. Walk to the shore of Inle Lake. We left Kalaw in the morning and after an hour drive, started a 9 mile walk through fields and forests down to Inle Lake. As the rainy season has just ended, the hills were incredibly green and fertile, with lots of different vegetables being cultivated. (There is also a multi day hike to Inle Lake that I have read about, which would be interesting as well). We walked through a few small villages where the local handicraft was bamboo basket weaving and stopped for a delicious lunch in one village. The “nearby” local market is a few hours walk away from these villages, and is open every 5 days. We passed many local woman who had gone to the market: they were carrying back all the things they purchased in bamboo baskets supported by a strap across their foreheads — and they are walking all that way in flip flops. I will remember this the next time I have to park far from the entrance at the supermarket!! It was an interesting way to catch a glimpse of local life.